Soak the lentils in sufficient water for a few hours. Drain and blend in a high speed blender till smooth. Add chopped onion, green chili, cilantro, salt, red chili, ginger to the the dal paste and mix well with hand. Fry in batches in hot oil till brown and crispy. Alternatively you can use the ableskiver pan to make the fritters. Keep aside. Heat mustard oil in a pan. Add panch phoron, hing, green chilies, and bay leaf. Then add the chopped vegetables. Sprinkle turmeric and salt. Cover and cook till the vegetables are half done. Now add the grated tomato, ginger, cumin and coriander powder. Mix well. Cook for a few minutes more. Then add 2 cups of water and bring the gravy to boil. Check for seasoning and add sugar if required. 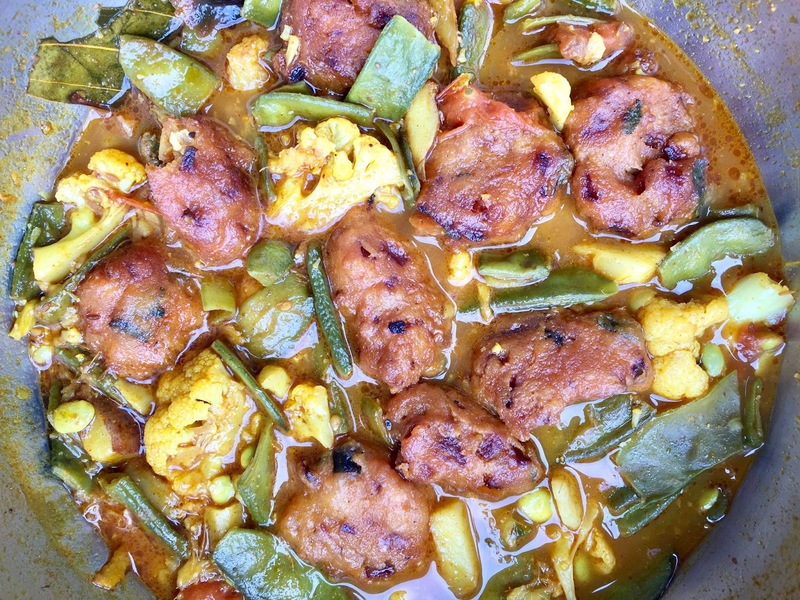 Once the vegetables are cooked, add the dal fritters. Remove from heat immediately and cover and let it stand for five to ten minutes.